Snowdrops for Faith: Why this particular title? And what are snowdrops anyway? And is this going to be one of those in-your-face religious babbles. The easy question first. I had never heard of snowdrops until several years back. I was going through treatments for breast cancer when a dear friend, Carol, presented me with a sandwich bag-sized surprise. Inside were three stems of a little flower. Graceful white petals with a delicate fragrance. Snowdrops: flowers that peek through the snow (even before the crocuses, daffodils and hyacinths) and remind us that the promise of spring with new life, new beauty and new joy is coming. Those flowers became a symbol of hope in the winter of my cancer season. Now that I am past the cancer, snowdrops are my prompt to look for the blessings that God has for me in every situation: good and bad. As for the second question. Yes, this is a blog about faith in Jesus Christ. I believe that I am a sinner. (I don’t have to state that fact for my family and close friends. They know it and see it.) But thank God that I am a redeemed sinner, saved by Jesus Christ’s perfect sacrifice on the cross. Because Jesus was raised from the dead, my life can and does have divine purpose for divine good. My intent is not to be judgmentally religious. Instead, I want my blog to be a journey of being real about the victories, the struggles and the fun of living out faith. Let’s encourage one another and enjoy the unique adventure that God has in store for us. I hope you will stick around for weekly posts. Debbie, I enjoyed meeting you yesterday at Springboro library and exchanging cards, as well. The inspiration for your blog is very moving. I love your gentle, respectful spirit. And I’m amazed that you figured out how to leave a comment on my blog. We’ll see if I can do the same with yours. Hello Debbie, thank you for the wonderful comment over on poetrycottage and for bringing me over to yours. Your ‘About’ page is full of the beauty of the Lord and lays His amazing creation and healing right before the reader. God bless. Thank you for your kind words! As we point each other back to Christ, we are encouraged! Only yesterday (9.02.2015) I noticed snowdrops growing in my garden whilst feeding the birds. They are growing very near to a Jasmine plant that used to be in my mothers garden. She planted it as it was a gift from me on Mothers day. Just before she died ( in 2012 from Lung Cancer) she asked me to dig up the white jasmine plant, which had grown to a beautiful 3 foot bush which was full of flowers, and re-plant it in my garden when she was gone. It was just outside her kitchen window where she used to sit for hours looking at the beautiful garden she had created over 30 years. After we buried her on, Mothers day I reluctantly dug up the Jasmine bush as she requested, and re-planted it in my garden. I say reluctantly because I am definitely not a gardener and I was worried that it would die. It has never flowered since. I think that maybe I have put it in the wrong place. However seeing the snowdrops has given me hope that one day it will flower, and be as beautiful as it was in my mothers garden. Janet, First I am sorry about the loss of your mother. It sounds like your mother was a true gardener! I am an evolving gardener which means I keep learning from real gardeners and through my own trial and error. Last fall I planted snowdrops along with other bulbs. (In the spring, I will run a short series on my blog about the allure and mishaps of a gardening novice!) I am so looking forward to seeing my snowdrops bloom as they always fill me with the anticipation of hope! Prayers that you will one day soon see your mother’s jasmine plant bloom. Check online and ask around. I watched a former neighbor move plants and shrubs all the time. Some did die, but most worked out just fine. I was amazed as I always thought of them as too fragile to mess with. I sense the beauty and peace of your mother’s garden and the symbolism of that jasmine plant. A special gift of memories from your mom to you. I ache for your jasmine plant to bloom again! Blessings to you and thanks for sharing your story! Thanks for explaining your title. I’ve not heard of snowdrops before so I learned something new today. It is a perfect symbol for new life amidst a cold season of life. Now I love your title! Thank you also for commenting on my blog. Do hope you will return to visit me. Blessings! Kathryneann, I will visit your blog again! I love snowdrops for their symbolism, their introduction into my life and for their simple elegance as one of the earliest spring-flowering bulbs even before spring has arrived. I am trying to grow snowdrops in my landscape with minimal success. This year (the first year) I had one single snowdrop bloom despite lots of plants that popped up. I will give it another year and see what happens. I may have to move them to a new location in my landscape beds. I refuse to give up though! 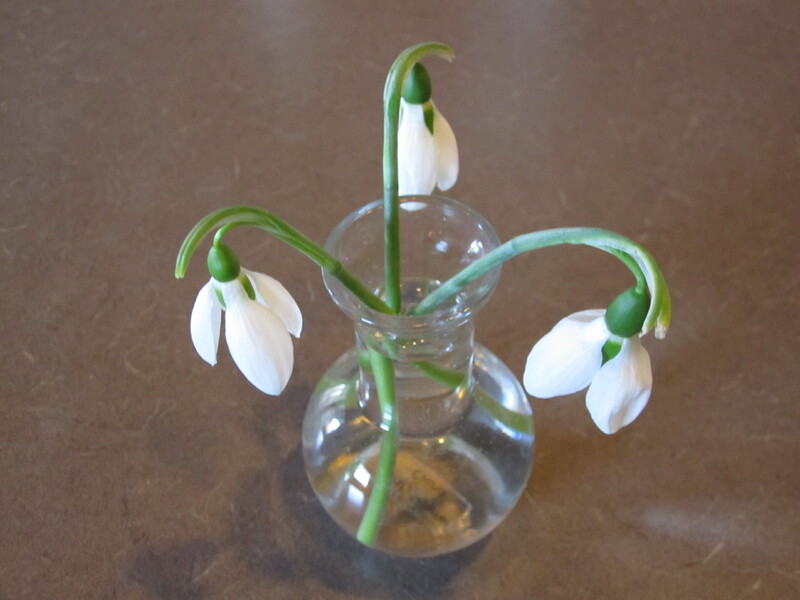 BTW I wrote a post about that single snowdrop. You can find it under the nature category, titled The Prequel to Easter. It was nice to “meet” you! Snowdrops are beautiful in their timing and simplicity! Thanks for the visit. I go back to John 10:10: “The thief comes only to steal and kill and destroy; I have come that they may have life, and have it to the full.” It’s wonderful that God can take something “bad” and use it as inspiration for something good! I am glad that you have brushed aside the “cobwebs” to clearly see God! Thanks for stopping by and commenting. Snowdrops are now my favorite flower too. Unfortunately, I am not having much like getting them to grow at my house. I have tried two different locations and only see a couple of blooms in total.